I am delighted to have all of you here today on this auspicious occasion that is the launching of Penang Bridge International Marathon 2017; which will be happening on 26 November 2017 at Queensbay Mall Outdoor Car park. The annual Penang Bridge International Marathon is the largest mass-participation sports event in Penang, bringing thousands of marathon enthusiasts annually. This year, we will be running on the first bridge due to many popular request from the runners. I am proud to announce that this year we successfully received more than 34,000 runners which comprised of 4 categories namely Full Marathon (42km), Half Marathon (21km), 10km run and Fun Run (8km). On the other hand, in a short while you will be able to see a catwalk showcase of our official running vest by Brooks who is the official apparel for Penang Bridge International Marathon 2017. In addition to that, I would also like to take the opportunity to thank all our respective sponsors who has been with us for the past few years namely SEIKO the official timer, EMICO the official medal sponsor, 100 PLUS the official isotonic drink, Asia Green the venue sponsor, Sports Toto, Milo and Nestle Fitnesse. Not forgetting our new sponsors such as Prudential as well as Vistana Penang Bukit Jambul the official hotel for your generous contribution. For your information, PBIM Committee will also be giving away cash prizes of RM259,200.00 which is the highest since inception of the run in 2008 to our Top 10 runners for each category including Best Malaysian ranking for both Full Marathon and Half Marathon. 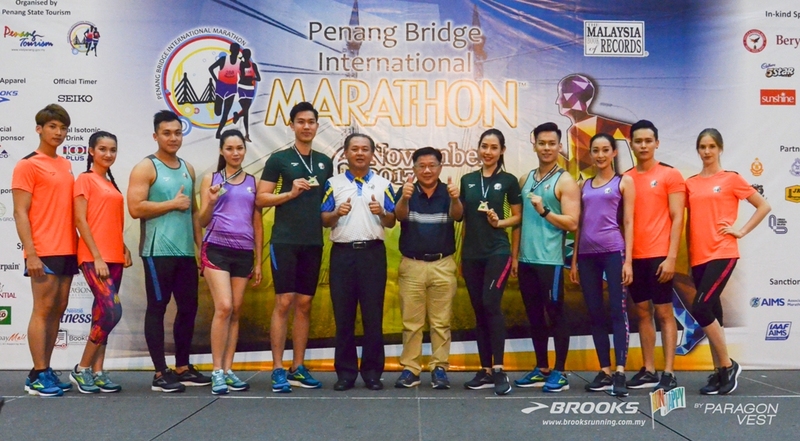 Named as the “Largest Bridge Marathon” for 4 consecutive years, the Penang Bridge International Marathon has placed Penang as one of the leading destinations for Sports Tourism in the region. Half of the runners are from outstation and outside of Penang, which makes the Penang Bridge International Marathon the busiest day for many hoteliers and hawkers. Long distance running is not merely a sport but also a test of patience and perseverance. The Penang Bridge International Marathon has long served as a platform for both professional athletes and amateur runners to personally challenge themselves physically and mentally to endure our challenging route and tropical weather. On top of that, many runners have been participating in the Penang Bridge International Marathon since inception every year. For many, the run has a special place in their hearts and they have met a lot of friends and family in the journey. Allow to again extend my gratitude to all sponsors that have assisted us in many ways to make this event a resounding success. We truly appreciate the support given to us every year.